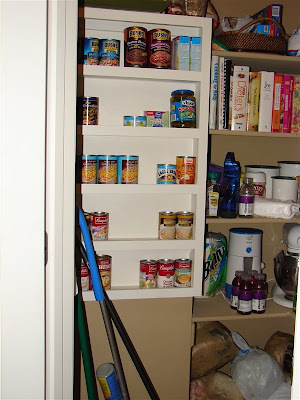 Today I would like to show you my pantry. I've never had a pantry before and I must say, I love it. 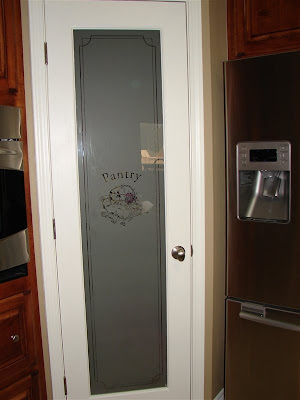 First thing that I love, is my pantry door. I love the glass panel and I love how it sets the room off. It really is a nice touch. 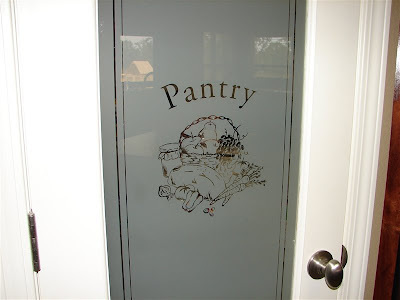 Here is a shot of the etching on the door. Now, a shot of the entire door. I also love how the pantry is in the corner. It gives us quite a bit of room. And now, the inside. We have four shelves that make an "L" shape. In that bottom part of the "L", the part on the left, they are extra deep. 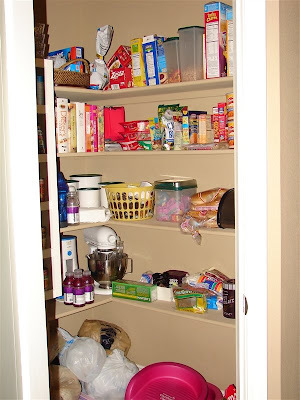 If you go into the pantry just a bit and look to the left, you can see my most favorite part. There are my custom can shelves!! LOVE, lOvE, LoVe, love them!!!! 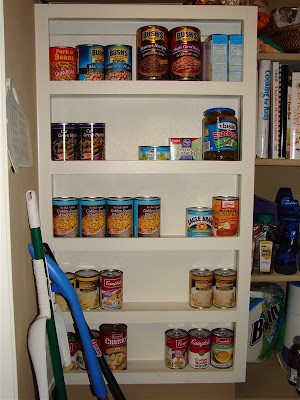 Here is a closer, straight photo of the can shelves. I told the guy what I wanted, which was: narrow shelves, just large enough to hold my largest cans, and have some sort of a lip on them to hold them on the shelf. We took this small space of a wall that really seemed useless and put something very useful there!! Did I tell you that I LOVE these??? Again, thank you for coming along for the tour. Just a few more stops to make and we'll be all done! See you tomorrow.